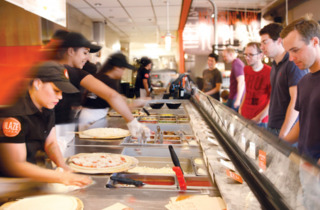 Photo courtesy Blaze Pizza Blaze Pizza is a fast casual spot in Lakeview. 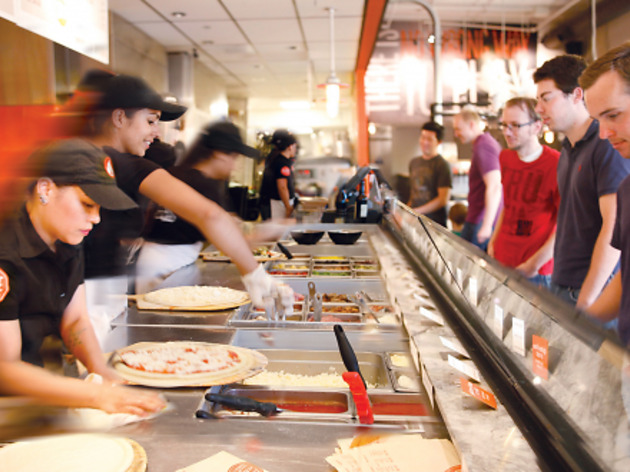 Thin crust pizza is served Chipotle-style at the fast casual Lakeview spot. Choose from a variety of toppings (pesto, meats, veggies, cheeses), and wait for about 10 minutes while it's cooked. This isn't life changing pizza, but it's a decent fast option. Even better than the pizza is the s'mores, made with McVitie's biscuits—add one onto your order and it'll be cooked alongside your pie. El stop: Red, Brown, Purple (rush hrs) to Belmont (Red/Brown/Purple). Bus: 77. This is definitely a favorite quick eats spot, conveniently located right off the Belmont stop. I love that every person in my group can get their own personalized option (no more compromising on toppings!) and for a really reasonable price. The spicy sauce is a personal fave and I've actually found myself trying other new things as result of all the great options available. Pizzas are out of the oven in less than 10 minutes and I usually still leave with a couple leftover slices.